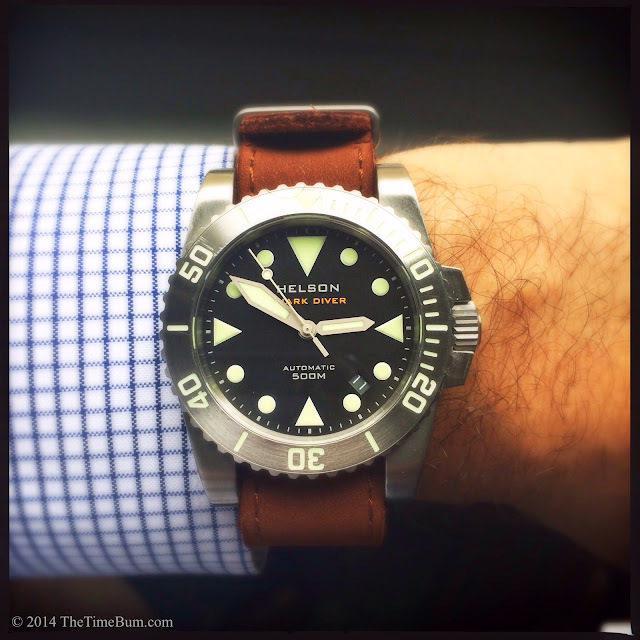 Shortly after the Helson Spear Diver Frame crossed my threshold, I was offered another watch from that manufacturer. 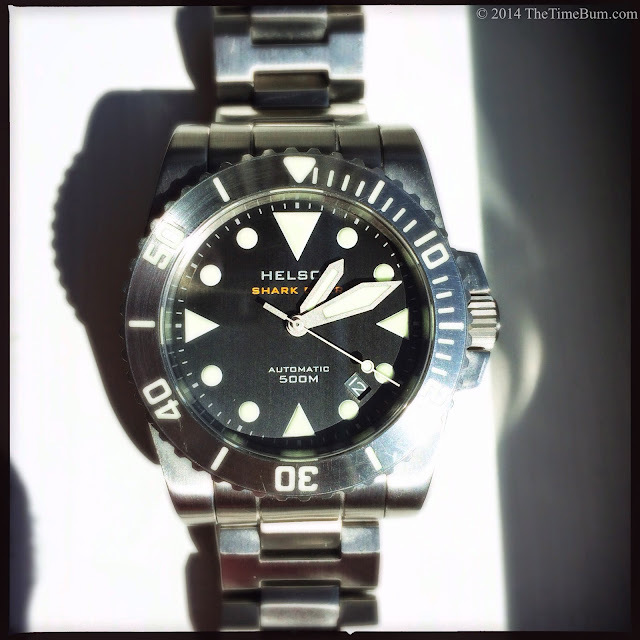 This time, Watch Otaku Paul Hubbard provided his personal Shark Diver 40. (He also sent his Armida A8 brass, keep an eye out for that review soon.) Bear in mind, this watch was his daily default for quite some time, so the photos show the scrapes and bumps of regular wear. 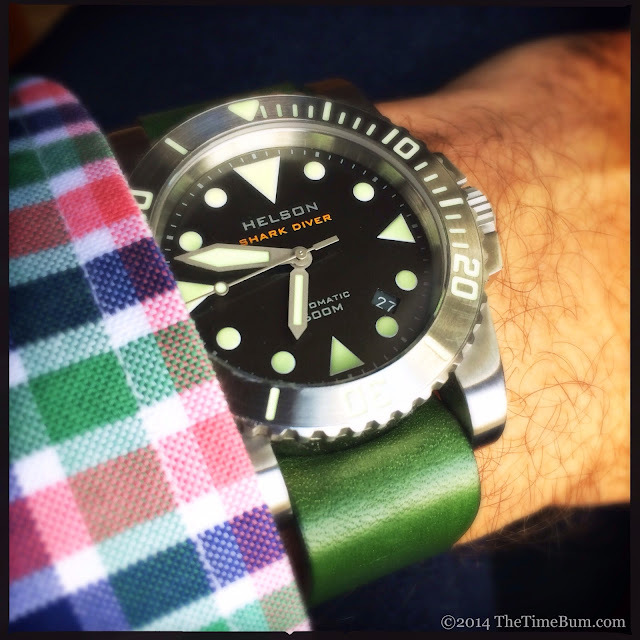 Now The Time Bum is generally a creature of dry land, so I did not test whether the Helson was suitable for diving for sharks, but I did wear it through a typical attorney's work week and can attest that it holds its own with sharks of the two-legged variety. Even out of the water, it is a rugged and attractive watch in a comfortable size. 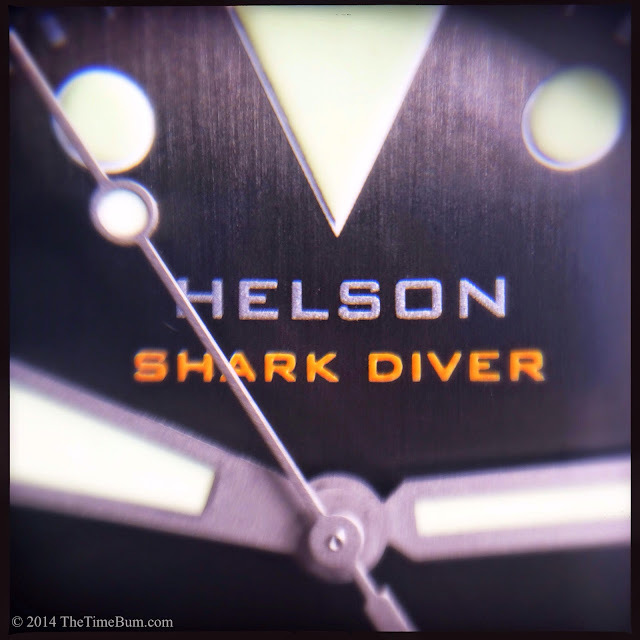 Helson offers the Shark Diver in three sizes: 45mm, 42mm, and 40mm. I have been known to wear watches covering this entire range and beyond, but I do find that smaller cases tend to get more wrist time for simple reason that I can wear them to the office. The larger ones only come out in evenings or on weekends. The 40x12x49mm case was an easy fit on my 6.5" wrist and under the barrels of my shirt cuffs. 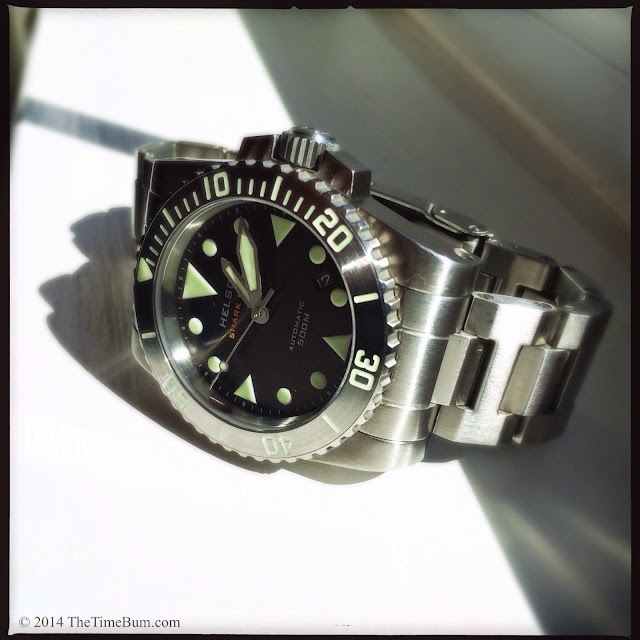 While it may be on the small side of the dive watch spectrum, it is certainly every inch a tool watch. The flat sides, angular crown guards, and 7mm crown look the business. The only soft lines are the slight bowing to the case sides when viewed from the top, and the steep curve of the thick lugs in profile. Every surface is brushed: case, bezel, and even the dark grey dial. 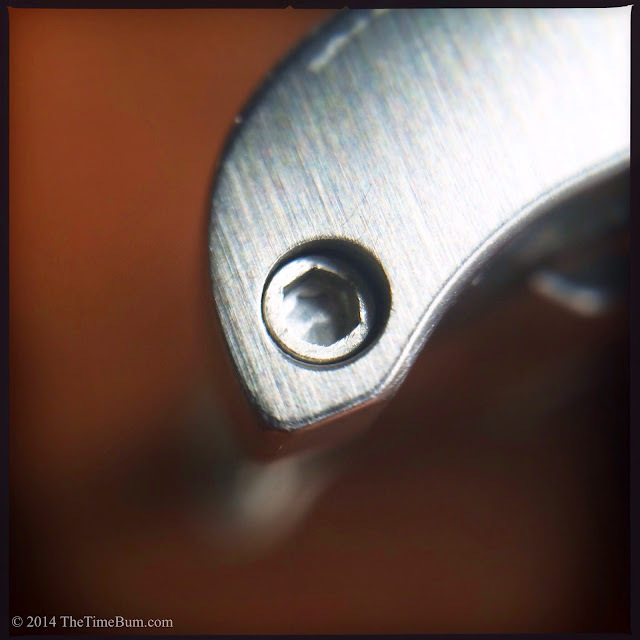 The overall impression is that the watch was hewn from a single billet of stainless steel. This overtly mechanical look is underscored by the deep gear-like teeth of the crown and bezel, and the exposed screws in the drilled lugs and bracelet links. 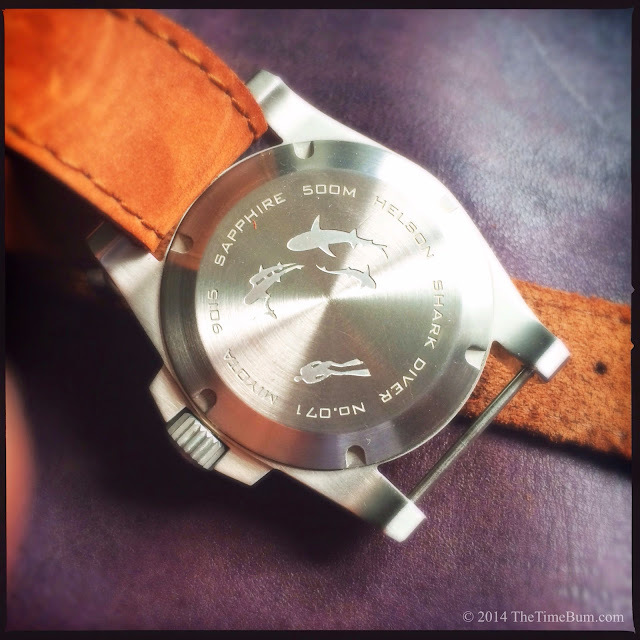 Sharks dive deep, so any watch called "Shark Diver" had best do the same. When it comes to toughness, the Helson does not disappoint. It is rated for 500 meters water resistance. The signed crown screws down, as does the case back, which is decorated with circling sharks. The crystal is flat sapphire, 3mm thick with an anti-reflective coating. The only thing the 40 gives up to its larger siblings is a helium release valve. My heart sank a little when I saw the exposed fasteners through the drilled lugs. Screw bars bedevil me. I know they are a secure method for attaching a strap or bracelet, but I had visions of stripped heads and scratched lugs. As it turned out, there was no need to worry. The bars have hex heads instead of the more common slotted screws. Removal was easy using the supplied hex tool, the deep socket providing a firm seat with no risk of slip. The supplied bracelet was just as tough as the case, both in terms of function and appearence. 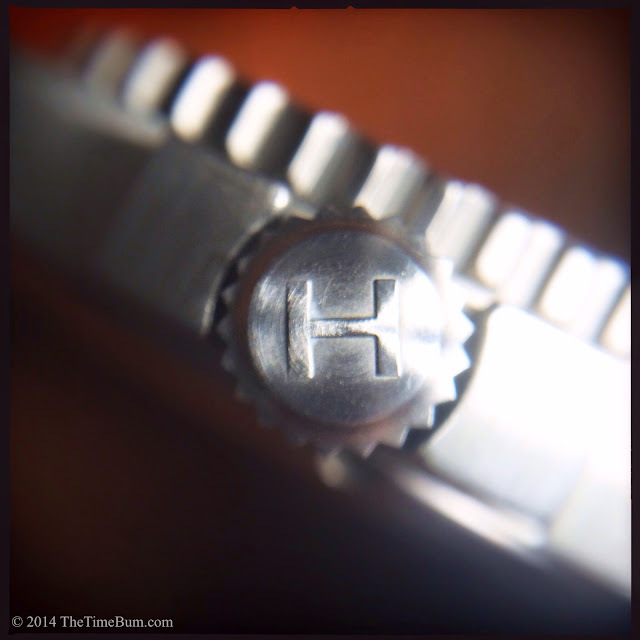 It has solid ends and heavy "H" links with a signed flip lock diver's clasp. The individual links are screwed, which means that for purposes of easy adjustment, I am too. I understand the utility, but sizing a bracelet using two little screwdrivers is a matter of high effort, low reward, and great risk of losing one of those tiny buggers. Still, I cannot fault a Helson for this decision. Like the screw-in bars, the screwed links are a sound mechanical choice and enhance the utilitarian appearence of the watch. The thick, brushed links complement the stout case and whole package reinforces the perception that you are wearing a serious tool in a compact package. Movement is the familiar 24 jewel Miyota 9015. Like every other 9015 I have encountered, it has a 28.8k bph beat rate, 40 hour power reserve, hacking and hand winding capabilities, and excellent accuracy. Unlike the others, it exhibits no rotor noise. All my other Miyota automatics whir when you move, presenting a noticeable reminder of the machine on your wrist. This one is silent. I cannot explain it, but I like it. The industrial aesthetic continues in the dark grey dial. Its visible vertical brushing, subtle sheen, and metallic color work beautifully with the brushed case and bezel. The plongeur hands are matte finished and filled with the same greenish Superluminova that graces the large, painted markers, and the engraved 120 click bezel. The only text is the brand and model at the top of the dial, and "Automatic 500 M" at the bottom. "Shark Diver" is rendered in dark orange. The effect is at once sober and dazzling - particularly at night when the lume lights up like a neon sign. The 4:30 window reveals another thoughtful detail: a color matched date. The Shark Diver is certainly a tool watch, but it exhibits just enough sophistication to go from the briny depths to the urban jungle. It may be more difficult to wear with a suit than, say, a Submariner style, but on the bracelet, it would not look terribly out of place. 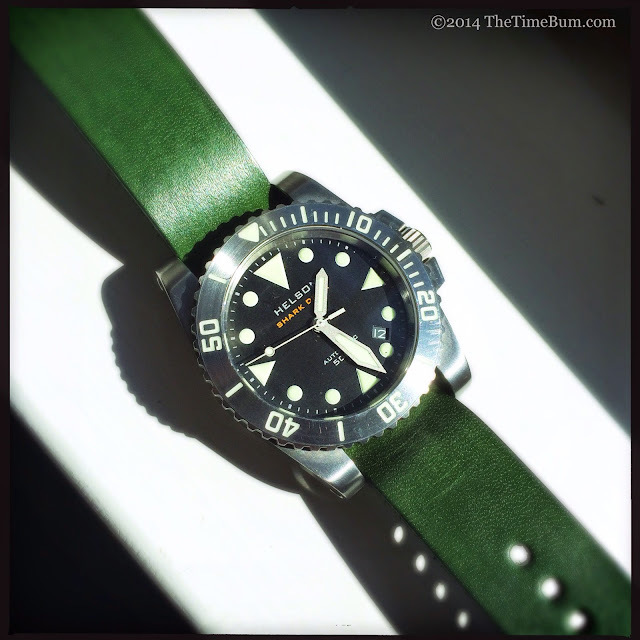 I had fun swapping the stainless links for a Palm Green leather pass-through strap from J. Grant's General Store. 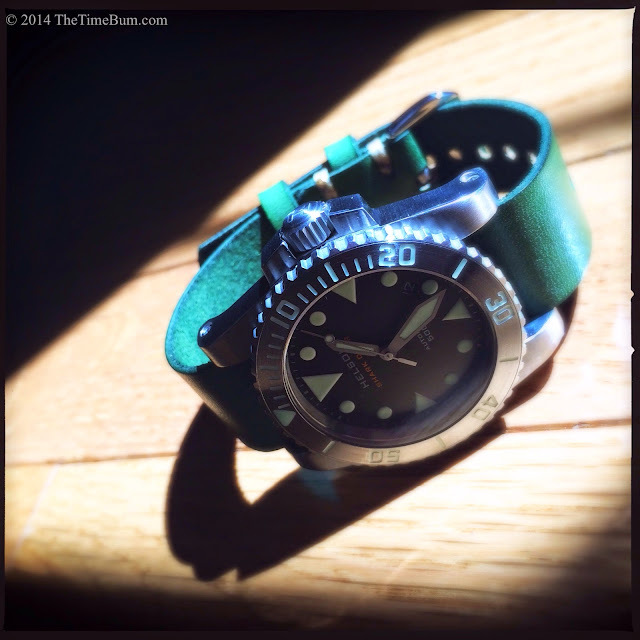 The strap color heightened the green in the lume, giving the watch an eye catching punch. For a more neutral look, I fitted a Victor & Wells Glenwood leather NATO. The two were beautifully matched as the bar allowed sufficient clearance for the thick brushed leather of this strap, the weight of the leather was sufficient to balance the hefty case, and the warm brown complemented the cool metallics. 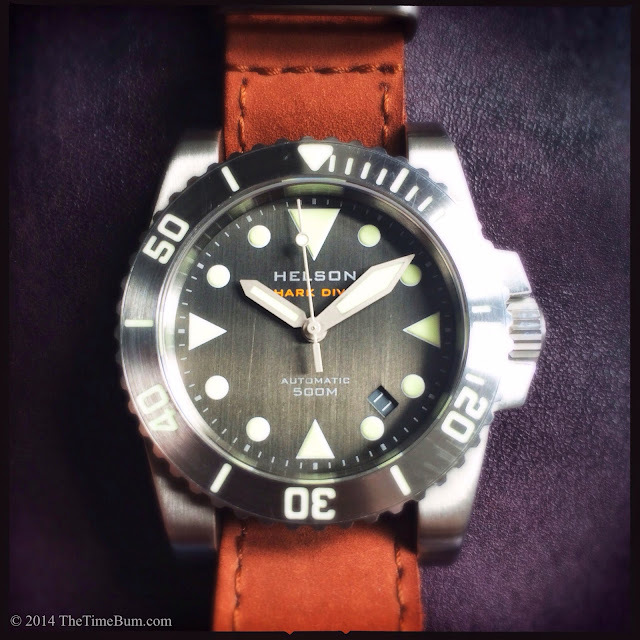 If you are ready to rush to the Helson web site to buy the watch, I have good news and bad news. First the bad news: the grey dial 40 has been discontinued. Now the good: it is still available in white and blue dials, both of which have sapphire bezels and look perfectly stunning. The 40 sells for $599 including shipping, bracelet, rubber strap, and hex tool, all stowed in a screw top tube with a cut foam insert. If you like the basic design and want to up the ante a bit, you can get a bronze version with an ETA 2824 movement for $1199. I was quite impressed with the Shark Diver 40. It is an exceptionally well executed tool watch. The specs are spot-on for price, and the design is sporty, aggressive, and surprisingly detailed. If you find you need a bigger boat, larger models are available, but the mid-size 40 is perfect for me. 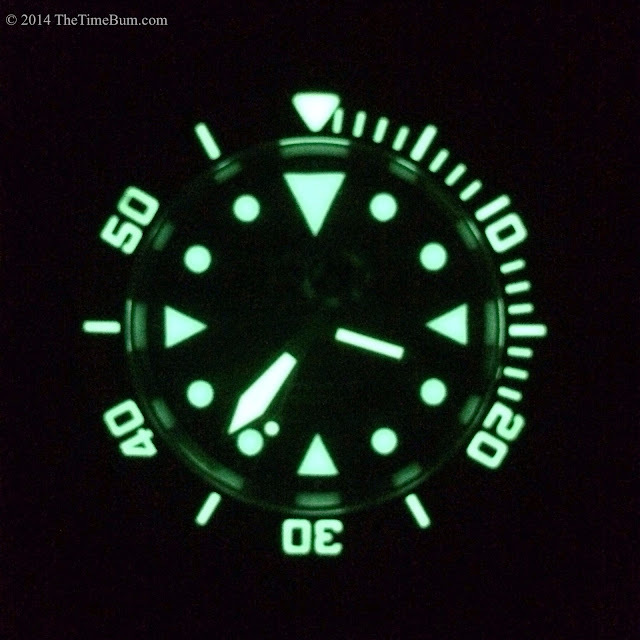 Pro: Killer looks, killer specs, killer lume. Sum: "Man goes in the cage. Cage goes in the water. Shark's in the water. Our shark." The Time Bum approves.